iOS allows users to control what apps can access the images and photos stored on their iPhone, iPad, and iPod touch. This is handled through the Privacy settings and offers granular control over which specific third party applications are allowed to pull images from the Photos app, Camera Roll, and also whether or not they are able to save new images to the on-device storage within Photos app as well. If you want to adjust or control app access to photos on an iOS device, or you just want to see what apps could theoretically access your devices pictures and save to the on-device image library, here what you’ll want to do. 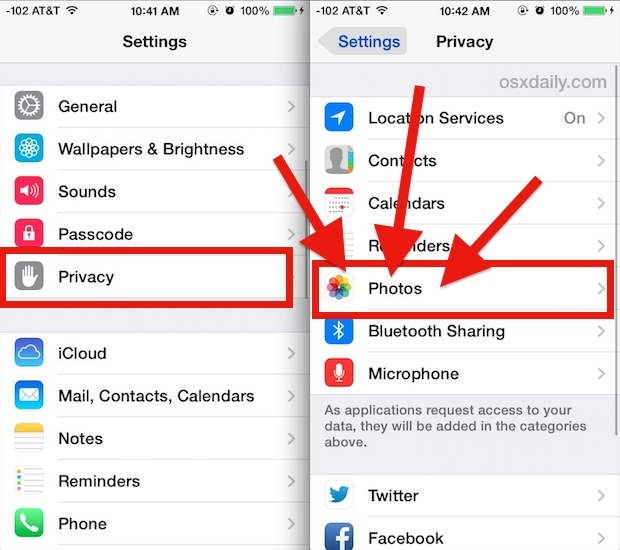 The apps shown in this Privacy > Photos list have requested access to the photos on the iOS device at some point in time. If the settings toggle next to the app name is in the ON position, that means that app can access photos and Camera Roll directly, either to upload new pictures to a service from the iOS device, or to save new pictures to the Photos app. Apps here may also have the ability to create a Photo Album within the Photos app as well. Only apps that are currently stored on the device will be listed here, anything that has been removed or uninstalled won’t show up in the list. If you want to prevent an app from having access to your iPhone / iPad photos, flip the toggle to the OFF position. 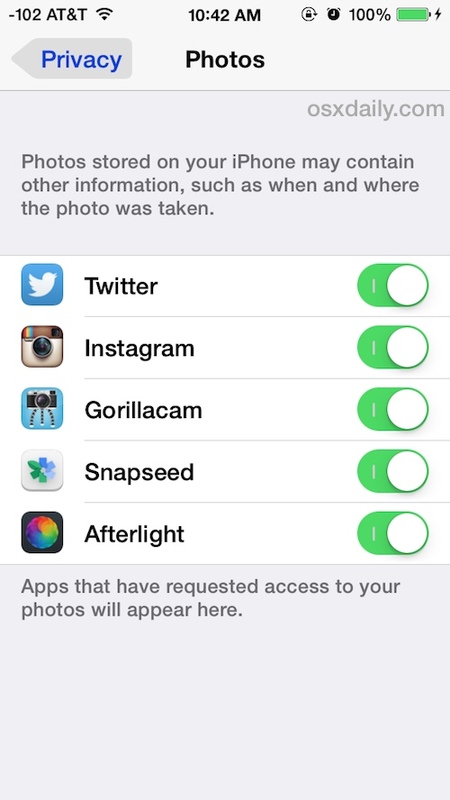 This prevents access to images and also removes the ability for that app to save pictures to the camera roll. Allowing access is done by adjusting the switch to the ON position. Generally speaking, apps that make logical sense to have access to the device photos should be listed here. For example, that may include photo editor apps like iPhoto, Photoshop, Flickr, VSCO, and Snapseed, and also social sharing and social network apps like Facebook, Instagram, Twitter, or Tinder – these are all apps that have legitimate reasons to access pictures stored on the iOS device. On the other hand, if an app looks out of place in this list, like a random game or some app that has nothing to do with images or sharing at all, you may want to consider disabling it. For those interested in limiting access to broader personal information stored on an iPhone or iPad, iOS also offers similar controls for Contact information and address book details, allowing users to block apps from seeing contacts if desired. Help! Apps don’t ask for access – that screen is always blank. I have tried uninstall – install trick no luck. I tried doing this but nothing appears…after i go to photos there arent any apps requesting access. Please Help! I deleted the app (Instagram) but Instagram still shows up as an album on Camera Roll. Help! Please help! No apps ask to use my photos. The screen is always blank. What do I do? What if the notafacation showed up and I press don’t allow in the app. How do I fix it? I’m okay with apps accessing my photos. But how do I stop the apps from creating their own album in my photos? I’m constantly having to delete them! Clutter drives me crazy. Anybody know how to change it? Unfortunately you can not stop the apps from creating albums in Photos app on the iPhone or iPad, but you can delete those albums created from the apps within the Photos app. The only way is to block an app from accessing the Photos app of iOS to begin with, by preventing the app from accessing Photos it can not create an album there. This may change down the road of course, but that’s the way it is right now. I have a question that is a bit off topic. When you click on a picture in your photo album app, and then select edit, you then have different options at the bottom such as cropping and filter. I’ve recently noticed the option that just has three dots (…). When I click on that option, I have enjoyed writing on the pictures or making little drawings on the pictures. Yesterday I clicked on the “more” option and was able to add a couple of my photo editing apps directly onto the three dots (…) option. I absolutely love this because it makes it so much faster and easier to edit photos without having to open another app. Here’s my question: How do I add another photo editing app to those options? I use Facetune 2 a lot and want to add it with the other 2 but can’t figure out how to do this. I know this is very wordy and probably very confusing so I apologize for that. I just didn’t really know how to describe what I wanted to do without actually showing y’all. Please help!!! Thanks so much!!!! Fb can not access my photo! I tried to go to privacy>photos> under there, there are no apps requesting for my photos! Help!